Yesterday I shared with you an idea for an infinity scarf teachers appreciation gift that included a simple sewing project. Here is another quick and easy idea for those of you who don’t sew, or don’t have time to make a scarf before the end of the school year! 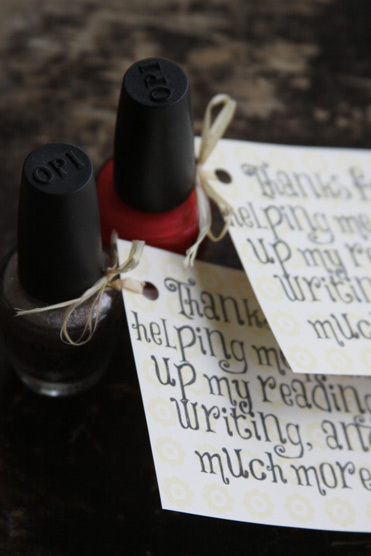 Stop and grab a nice bottle of nail polish in a shade that you think your child’s teacher will like. Maybe a bright fun color for summer. 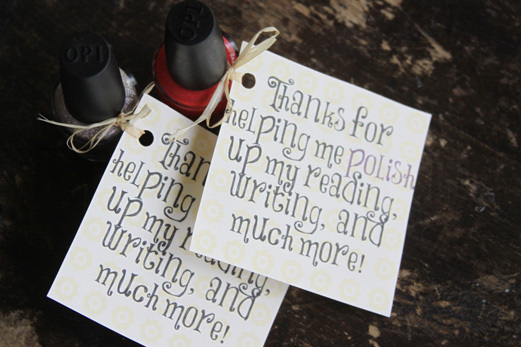 Then add a little tag that says: “Thanks for helping me polish up my reading, writing, and much more!” This would make a great little thank you for any female influence in your child’s life, and can be easily personalized by changing up the phrase or by adding your favorite teacher’s name to it! and let the kids deliver it on the last day of school to thank their teacher for all of their hard work throughout the year. If they have a male teacher you could do the same with a bottle of shoe polish or something along those lines! Happy last few days of school! Thanks for the super ideas! I needed a craft for 2nd graders that wanted to make something special for their parents. The bird bookmarks were perfect!